Though in some ways he’s been overshadowed by other defensive prospects – Martin Marincin, drafted a year earlier, has made the jump to the NHL while Darnell Nurse has better draft pedigree – Oscar Klefbom remains one of the more significant young players in the Oilers organization. We were able to catch up with him on Monday in Oklahoma City and ask him some questions about his season and what he brings to the Oilers. “You guys had meetings with the Oilers’ development staff. This guy is looking like he is going to be a great defender. I can’t believe that so many people are suggesting that we trade him as a throw in on a deal. People were saying the exact same about Marincin before he played an NHL game, and look how good he is. There is absolutely no reason that Klefbom can’t make the same impact next season. Defence is a position of weakness on this hockey team, not a strength, so we shouldn’t be trading away our top defensive prospects. Sure, Klefbom, Marincin, Nurse, and possibly Ekblad will take time to develop, but all 4 have a great chance of being head and shoulders above the majority of the defence we have now. Honestly, all 4 have a good chance of passing Justin Schultz, as they put a greater effort on keeping pucks out of their own net, while also being to make a good first pass.We need to develop all of these young defencemen, with the help of Nelson (who is doing amazingly well in developing prospects), and take the best 7 Dmen we have. We have the opportunity to turn this position of weakness into a position of strength within a few years if we just stay patient with developing defencemen, and wait to see what they can do in the NHL before trading them. Klefbom is going to be a gem, I just hope it is with the Oilers. See the thing you’ll notice is (myself included) no one on here actually watches the OKC Barons. You may watch the highlights from a game or for some reason watch a stream of it (if they exist) but no one consistently watches them play. So when they look at point totals or numbers on their performance they think they know how a guy is doing. Moreover, they read articles of a persons thoughts on their play and think they know how a player is doing. So this is why I find it really hilarious when people talk about the quality of play of players that they have never even seen play before. When they come up and play for the Oilers, sure then you can make an assessment. Until then I see no benefit in trying to comment on the development or trade value of players who you don’t even watch. Or getting the scouting report on a player who was seen one time, maybe he had a great game, maybe he had a bad game, or maybe he’s Sam Gagner and has an 8 point night…I’m sure the scouting report would have been outstanding if a person had only seen Gagner that one time. End of the day, let’s keep to talking trade value on the players we actually watch and not giving these crazy estimations on value for players we don’t. Oh and JW, great article, getting the thoughts of the actual player on their performance and situation is what is actually needed in these scenario. Really? JW has been watching Klefbom all season, and has been saying he has been very solid. LT has been doing similar articles as well. Todd Nelson has been giving Klefbom glowing reviews. And yes, there are streams out there, and yes, I do watch them when I can. I don’t claim to be a scout at all, but Klefbom is getting very good reviews from multiple prominent, intelligent hockey reporters. Multiple people are saying he has been showing great progress. Thats not someone you trade away as a throw in. Just because you don’t follow prospects closely doesn’t mean that everyone doesn’t. Heck, after the season goes south they are the most entertaining to follow. Jim Byers and Todd Nelson did at Buffalo Wild Wings with Klefbom last Monday. I haven’t heard that one. Is there a podcast you could link to? Great interview, what is your personal opinion of when Oscar will be ready? The little bit I’ve seen and heard about Rockey Thompson sure seems positive, you are there what do you think of his chances to make the next step if the Oilers say brought up Todd Nelson to replace one of the current assistants next year? I lean towards the midpoint of next season for Klefbom, giving him the rest of this year in the minors and letting him hit the NHL on roughly the same curve as Marincin. Of course, he might be ready now, too. As for Thompson, I don’t know him well but the impression I have is that Fleming (who has head coaching experience) would be the logical successor if Nelson were promoted. Thanks, after watching Paul Stastny’s two way play at the Olympics I now have to agree with you that he could be a perfect second line center for the Oilers. Keep the bomb. People who shggest throwing him into a deal need to look no further then Marincin. Marincin value is huge right now. Klefbom value could be higher. Frankly let develop our defence. This team ain’t going nowhere until we develop from the backend. Even though I advocated trading Klefbom in previous comments, I don’t really think it’s such a smart idea. The only thing that concerns me is Klefbom, Marincin and Nurse are all left sided d-men. Petry and Schultz are decent on the right, but would be great to have a monster on that side. Maybe one named Ekblad? It’s nice to have not just one, but three highly valuable defensive prospects. Hopefully between free agency, our draft pick, one of our three defensive prospects, and maybe even one of the wonder kids, the Oilers can get a top 2 defender, and some more size and grit in our top six. Though I would love Callahan (not big, but plays gritty and is very defensive minded), or Spezza (just never going to happen), I think maybe a guy like Steve Downie might be a good addition to the top six. With any luck a ton of money can land a guy like Stasny. I have no idea how to get a top 2 defender, those guys just don’t ever seem to get traded. Edler maybe? Erhoff? The team just does not seem that far. Having said that there are some very good teams in the league on paper, but just can’t seem to put it together. I mean, look at Philly, that seems like the team Oiler fans are trying to build, and they are not enjoying success. I agree with other posts here that we need to develop these guys, the problem is it often takes years before they control a game like a Weber, Pronger, etc. The unfortunate truth is it’s almost impossible to acquire these types, and they are few and far between. We just need to hope we get lucky and a couple of these guys turn into high end dmen sooner than later. Overpaying for a Coburn-type is silly…..if he was a game controller Philly wouldn’t be trading him. Let’s just hope we have a Doughty in our group, (quick developer), and they aren’t all like Hedman, (wait 5 yrs before they are impact dmen). Sweet baby Nugelets, if you aren’t watching the women’s gold game turn it on RIGHT NOW. Who in the heck trashes this comment?!?!?! Women’s GOLD! What a game! Marie-Philip Poulin is the female Jordan Eberle. I guess Wanye loves her too. WOOOT! Canada kicks a$$!! Can we get Marie-Phillip Poulin signed to a contract please? Havnt seen him play much, but this guy is a keeper, Lets keep in mind he lost a year to injury, so he is behind the curve, when you compare him Marincin. 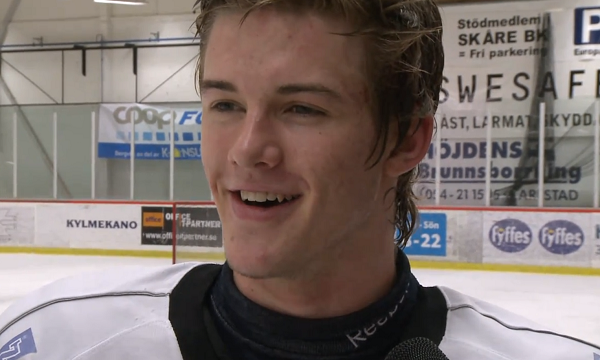 One scary part of his interview, in that he thinks Musil is a great skater…lets hope he isnt testing his speed against Musil. Spyder – I just hope the mens team was watching. THAT is the indomitable spirit of Canada. The same refusal to give up no matter how hopeless it seems that enabled the Summit Series heroes in 1972 to win three straight games in a hostile country with very dodgy officiating. A few years after the Summit series one of the Russian players or coaches(it was been a while and cannot remember who)said the difference between Canada and Russia in that series was Canada’s will to win.They would do anything to win, including breaking ankles.I added the breaking ankles part. Of course the men were watching and cheering.They showed some in a skybox. A comeback for the ages,way to go ladies. Seems like a sharp focused guy, I like that. Was it just me or when you read Klefboms comments they had a European accent? ?